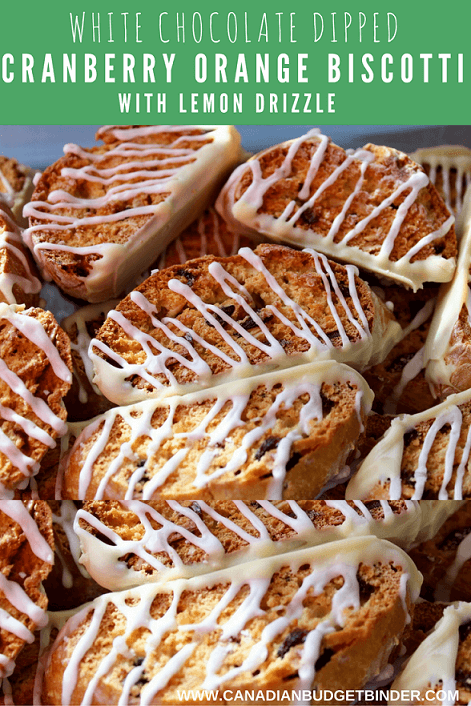 BAKING SHOULD BE FUN AND THAT’S WHAT YOU’LL HAVE WHEN YOU MAKE THESE TWICE-BAKED CRUNCHY BISCOTTI DRIZZLED WITH LEMON ICING. I’m in the kitchen again getting ready to bake more Christmas cookies for gifts and friends who pass by for a visit over the holidays. It’s always nice to send company home with a little care package and I like to do that sometimes with baked goods I’ve made. The aroma in the air today will be from Cranberry Orange Biscotti dipped in white chocolate then finished with a drizzle of lemon icing. You’re already brewing the coffee aren’t you? Biscotti are Italian biscuits that are twice-baked so they are delicious and hard with a bit of chew. You enjoy biscotti along with coffee or tea whenever you get the urge for something sweet. When you’re visiting Italy you may learn that the Italians also enjoy their biscotti with sweet wine. Cranberry Orange Biscotti are so easy to make and take very little time and effort. The best part about biscotti is sharing them with those you love. Another thing to consider is the cost of making biscotti vs. store-bought biscotti. Prices for biscotti can be quite high so you’re best off making them at home. 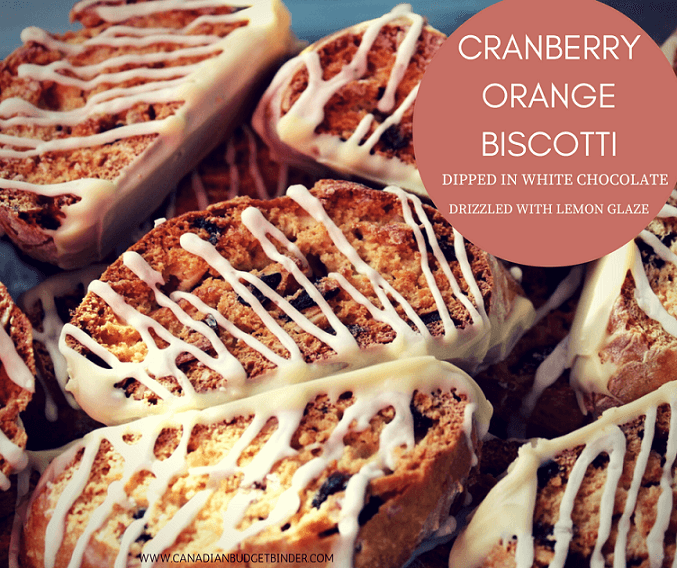 For this Cranberry Orange Biscotti recipe I’ll be switching up my Lemon Biscotti recipe by adding candied orange pieces and dried cranberries. This will allow for a more festive biscotti that would look smashing on any food or sweets holiday table. The colour and textures in these Cranberry Orange Biscotti are perfect paired with the lemon drizzle and dunked in a luxury of melted white chocolate. The perfect morning treat or way to end the day. Biscotti are by far one of the best dipping cookies out there. They are crunchy and filled with wonderful flavours depending on the kind of biscotti you want to make. 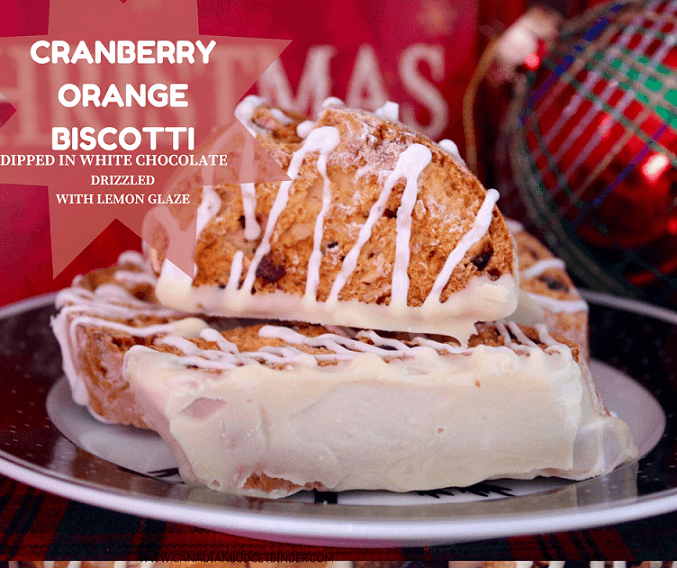 Today we have an orange cranberry biscotti dipped in silky white chocolate and drizzled with lemon glaze. Preheat oven to 350 degrees and line cookie sheets with parchment paper or a silpat. In another bowl combine the flour, baking powder, baking soda, salt, cranberries and candied orange peel. Dough will be soft and sticky, if you find it too sticky add up to ⅓ cup more flour 1 tablespoon at a time until manageable. Mix another egg yolk with a teaspoon of water together and coat the top of the logs then place in the oven until golden brown, for approximately 20 minutes. Once cooked let cool for 10mins, slice them on a diagonal and replace on the cookie sheets. Cook for a further 5 mins or until golden then turn and cook for a further 10mins until crunchy and lightly toasted. Let cool and finish off with the lemon drizzle, and dip the base of the biscotti into the melted white chocolate. There you have it a wonderful decadent orange cranberry biscotti that is sweet and fruitful. If you’re stuck for a last-minute gift idea you won’t see a disappointed face from whomever receives them. Besides homemade anything that is given as a gift shows how much you care and the time you put into creating the gift. Quick storage tips include keeping the cranberry orange biscotti in an airtight container in the fridge for up two weeks if they are not found lol! You can also freeze them for up to 3 months. Defrost and enjoy.